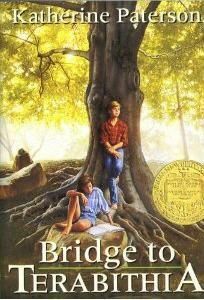 Bridge to Terabithia was my first selection for the Newbery Through the Decades Challenge -1970s. It has been on our shelves for years but I had never opened its pages. This story that one of my daughters told me I should not read. It only took me a couple of days to read about Jess and Leslie. In a very simple but engaging way, Katherine Paterson tells the story of Jess and Leslie, a young boy and girl who became close friends and create their own world across the creek: Terabithia. Jess and Leslie do not seem to fit in with their peers. Terabithia provides them a place to escape and let their imaginations soar. As king and queen of this magical land, the troubles of life drift away. There are no expectations, no bullying, no older sisters, no fears, no worries. With each other they gain confidence to face life and what it offers. Then the unexpected happens…..there is tragedy, loss, and pain. Even the magic of Terabithia can’t offer an escape from what must be faced. A bit of a spoiler….. When I began reading Bridge to Terabithia, I was aware of how the book ended. I went into reading this with low expectations. Knowing the ending, would I even enjoy the story? Yes, I would. Seeing these two children create a magical world in the woods is a glimpse of what childhood should be. I know my children have created imaginary worlds in the woods. And having a friend who understands and shares in that imaginary land with you is a treasure; a friend who makes you brave and strong. As we approach the end, death comes to Terabithia. While Jess is away, Leslie goes to Terabithia alone and falls into a flooded creek. The loss of Leslie hits Jess hard and he is devastated. But because he has seen the beauty of friendship, Terabithia is not lost to him. He is able to share it with others. Now it was time for him to move out. She wasn’t there, so he must go for both of them. It was up to him to pay back to the world in beauty and caring what Leslie had loaned him in vision and strength. As for the terrors ahead—for he did not fool himself that they were all behind him—well, you just have to stand up to your fear and not let it squeeze you white. Right, Leslie? An emotional read for some but a worthy read. It can open up the door to great conversations with your children. This is a book that the reader will likely love or hate. My daughter read it a few years ago and she greatly dislikes it. She felt betrayed, I think, when Leslie died. She recommended that I not read Bridge to Terabithia. I am glad that I did not heed her recommendation. There is sometimes sadness as you journey to Terabithia. There is beauty in not having to face it alone. This entry was posted in Book Reviews, Books, Something to Share and tagged Books, imagination, literature, reading by sweetie. Bookmark the permalink. We just got done reading this in class. The children and I had some very interesting and emotional conversations afterward. We enjoyed the book over all.